While full-thickness corneal transplant techniques have not changed much over the past century, lamellar corneal transplant techniques have evolved rapidly. To novices, the numerous acronyms that accompany the various corneal transplant techniques can easily become a disorienting alphabet soup. This article aims to introduce readers to the keratoplasty techniques that are most commonly used today (Figure 1). 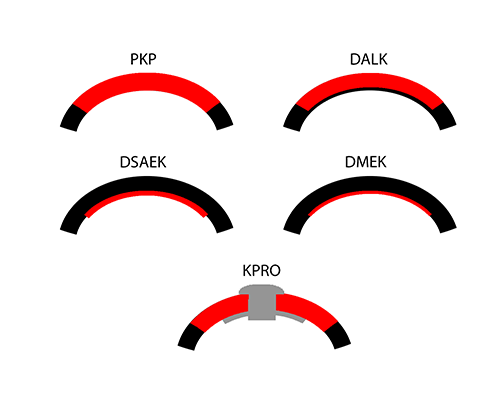 Figure 1: Schematic portraying the region of corneal tissue transplanted (red) for various modern keratoplasty techniques, including penetrating keratoplasty (PK), deep anterior lamellar keratoplasty (DALK), Descemet stripping automated endothelial keratoplasty (DSAEK), Descemet membrane endothelial keratoplasty (DMEK), and Boston Type I Keratoprosthesis (KPRO). When Eduard Konrad Zirm performed the first successful full thickness penetrating keratoplasty in a human in 1905, he became the first person to perform a solid organ transplant. Ironically, he performed the surgery for one of the most challenging indications in ophthalmology – bilateral alkali burns (1-3). His donor was an 11-year-old boy whose eye was enucleated due to foreign body penetration and scleral injury. Emulating Zirm's technique, surgeons began to perform corneal grafting over the subsequent 30 years using enucleated eyes of living donors (4). Vladomir Petrovich Filatov, a Russian ophthalmologist, became known for his work on eye banking in the early 1900s. He suggested using cadaver corneas as donor tissue and developed a method to do so (4). Over the past century, keratoplasty techniques have evolved considerably. There were early efforts to devise selective tissue replacement techniques that might preserve healthy corneal tissue and avoid risks associated with full-thickness grafting. Anton Elschnig performed the first anterior lamellar keratoplasty in 1914, for a case of interstitial keratitis. Charles Tillet performed the first successful endothelial keratoplasty (EK) case in 1956 for corneal edema. However, the introduction of lamellar techniques actually propelled penetrating keratoplasty (PK) to the forefront of popularity after 1950 (1). Initially, anterior lamellar techniques were fraught with the problems of interface haze, scarring, and epithelial ingrowth. Tillet's EK technique, although successful, was not repeated and no additional clinical cases were reported for decades. It was not until the late 1990s that EK was reinvestigated, revised, and reintroduced into clinical practice, launching the modern era of lamellar keratoplasty. Gerrit Melles experimented with eye bank cadaver eyes and then with animal eyes to bring EK into the modern era. Melles described an approach called posterior lamellar keratoplasty (PLK), in which the posterior cornea was dissected out and replaced with posterior stroma and endothelium from donor corneal tissue (1, 5-7) . Melles contributed the foundational concept of self-adherent graft tissue that required no sutures and could be supported initially by an air bubble. In 1999, Mark Terry introduced modifications to simplify Melles' PLK technique, developed new instrumentation, and coined the technique deep lamellar endothelial keratoplasty (DLEK) (1, 8) . However, these techniques were technically difficult to perform, required extensive manual lamellar dissection, and were not adopted widely. Patients healed rapidly compared to full-thickness transplants, but the presence of a deep stroma-to-stroma interface limited postoperative visual acuity typically to the 20/40-20/50 range. In 2004, Melles made additional technical modifications, and introduced the idea of stripping and removing the patient's Descemet membrane and endothelium with his Descemetorhexis technique. This new technique was renamed Descemet stripping endothelial keratoplasty (DSEK). After Mark Gorovoy introduced the microkeratome for automated preparation of donor cornea, manual lamellar dissection could be eliminated entirely, and the procedure was again renamed as Descemet stripping automated endothelial keratoplasty (DSAEK). Francis Price proposed additional technical modifications, and again, Terry introduced simplifications and new instrumentation. DSAEK allowed patients to achieve improved postoperative visual acuity results, to the 20/25-20/30 range, because its graft-host interface is more smooth (1, 9) . With the advent of eye bank prepared donor tissue in 2006, financial and technical obstacles were removed, and DSAEK surgery became the most commonly performed method of endothelial keratoplasty and procedure of choice for the treatment of corneal edema. In 2006, Melles went on to describe a technique known as Descemet membrane endothelial keratoplasty (DMEK) that allowed for transplantation of a pure Descemet membrane and endothelium graft, and exact anatomical replacement of diseased tissue in cases of endothelial dysfunction. Compared to DSAEK, DMEK allows even faster visual recovery, better postoperative visual acuity results, and greater overall patient satisfaction due to elimination of the stroma-to-stroma graft-host interface (10). However, the initial donor preparation failure rate and surgical learning curve prevented widespread application after introduction of this technique (1). Mirroring the evolution of DSAEK, as surgical techniques have become standardized and eye banks have begun to prepare DMEK graft tissue, DMEK is rapidly becoming the procedure of choice for endothelial keratoplasty for the treatment of Fuchs endothelial dystrophy and pseudophakic bullous keratopathy. Additionally, anterior lamellar keratoplasty (ALK) techniques have been refined over the past 40 years. In the late 1970's Malbran and Gasset were performing deep anterior lamellar keratoplasty (DALK) to excise and replace the corneal tissue anterior to the deepest stromal lamellae with impressive results including 80% of keratoconus patients achieving 20/40 or better visual acuity (1, 11) . However, obstacles remained that limited the popularity of this approach, including achievement of a reproducible separation plane between posterior stroma and, ideally, Descemet membrane. In 2002, Anwar and Teichmann introduced their "big bubble" pneumodissection technique in which a bubble of air is injected deep into the corneal stroma to establish separation of the posterior stroma from Descemet membrane (12). Their technique has allowed surgeons to achieve more consistent results than previous methods, but in some cases, intraoperative conversion to a full-thickness PK is still required. For patients with keratoconus or scarring that does not involve Descemet membrane or endothelium, DALK is considered by most to be the surgical treatment of choice (1), although extended operating times due to the need for careful lamellar dissection have limited its popularity. Keratoprosthesis, the transplantation of an artificial cornea, was first performed in Italy by Benedetto Strampelli the 1960s (1). Patients requiring repeat corneal transplantation highlighted the need for an alternative to corneal allograft treatment, as graft survival rates drop with each additional procedure. Historical options have included the osteo-odonto-keratoprosthesis (OOKP) and AlphaCor artificial cornea. These have since been largely replaced by the Boston Type I Keratoprosthesis (KPro), which became approved for use by the U.S. Food and Drug Administration in 1992 (1, 13). The device consists of a clear plastic optic and a prosthetic plate that are sandwiched around a donor allograft or the patient's own corneal tissue. The device is then sutured onto the recipient eye to replace a failed graft or the native cornea. Keratoprosthesis surgery is a procedure of last-resort, reserved for patients who are not candidates for other types of keratoplasty.